The PTRU has at its disposal a wide array of imaging technology and expertise spread over multiple core facilities and shared resources across the Duke University Health System. 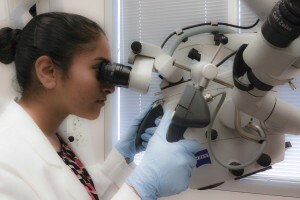 The Optical Molecular Imaging and Analysis (OMIA) Shared Resource provides a variety of optical imaging services, technologies, equipment and expertise. Optical techniques have become an increasingly important tool for understanding molecular mechanisms of cancer development and therapy. Its high sensitivity and specificity enable elegant studies into gene regulation and functional processes involved in cancer progression and therapeutic response. The other key advantage of optical techniques is that they are non-invasive and relatively cost effective and so can be done serially in the same animal, allowing for better characterization of transient or dynamic effects and minimizing the overall use of animals. No other modality can provide all of these benefits. Window chamber surgery training and support. Scientific guidance on experimental design, data analysis and interpretation. The PTRU also has access to Duke’s state of the art Translational PET/CT Molecular Imaging Center. FDG PET / CT is currently the “gold standard” tumor staging modality for the vast majority of patients with cancer. Prior to June of 2013, most patients in need of clinical FDG PET / CT were faced with the “coverage under evidence development” (CED) reimbursement issue posed by the Centers for Medicare and Medicaid Services (CMS, commonly known as Medicare). The translation of this scientific imaging modality into clinical standard of care required over 2 decades. Quantifying disease progression at a molecular level.